There are many different ways to break into the freelance writing business. Sometimes people leave a full-time job knowing they've made enough contacts to get work. Some writers start out by finding small writing jobs online. Others work in a related business, like public relations, and have enough of a portfolio to approach past clients, and others. Freelance writing is the practice of writing for money while working on one's own and not employed by a company or organization. Freelance writers produce whatever written text is needed by their clients, either working from home or in a rented office space. Writers can have many different clients, or, one very large client with a lot of steady, on-going work. Writers can work as generalists and cover topics as far-fetched as automobile and architectural design. Or, specialize in one area, such as the culinary arts, for example. There is no right or wrong. It simply a matter of preference, coupled (perhaps) with background and training. How Does the Freelance Business Work? Freelance writers are not only writers but are often also marketers, marketing themselves and their skills to potential clients. 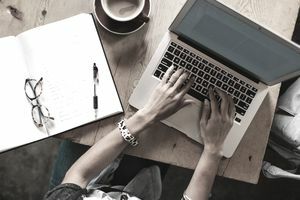 Freelance writers are also often business owners because they must form a business, such as an LLC, in order to separate their personal finances from their business finances. Successful freelance writers are often a combination of artist wordsmiths and shrewd business owner. You may consider yourself a talented writer, but you still need to sell yourself and manage your own finances. What Is a Freelance Writer Tasked With? Freelance writers compose whatever text their clients need. That is the creative side. But, freelance writers often approach their work like any other business, spending part of their time seeking new business and the other part of their time staying on top of record keeping. However, between 60 and 75 percent of the writer's time should be devoted to writing copy whether it's magazine articles, websites, press releases, blog posts, newsletters, internal corporate communications, or brochures. Every client has their own process and payment type. Sometimes a client will want the writer to send them an invoice when the work is done, or they pay half up front and the remainder when the work is handed in. Sometimes, clients simply want a Paypal message that reminds them that payment is due and then a check is dispersed. Other clients have intricate computer systems that tell them when it’s time to pay a writer, and no action is needed on the part of the freelancer. Many individuals and smaller businesses like the convenience of Paypal. However, large organizations stick to the more traditional system of sending checks by the due date noted on submitted invoices. Whatever kind of payment schedule is used, the writer has to be really good at budgeting and money management because the onus on them to get paid in a timely fashion. Why Are There Freelance Writers? One reason this career exists is that people, or companies, often need only one project done at a time, such as one booklet written to launch a new product. Or, a large or small business needs copy produced for their new website. Hence, there’s no reason to hire an employee. Instead, it’s simpler to enter into an agreement or contract with an individual writer. Even if the business ends up having several projects in a year, it's still less expensive to farm out the work as opposed to hiring an employee who requires benefits such as health care. Additionally, in today's digital work world, many companies simply don’t exist in a fixed physical location. Those companies need workers who are able to work independently, in their own space. More and more of these companies are contracting with individual workers not just in different zip codes, but in different parts of the country. This explains the explosion of the popular WeWork shared office space locations springing up across the U.S. The life of a freelance writer is not only an independent life with a great deal of flexibility​ if one becomes skilled in the business side (and works hard enough) it can become a financially successful life.